Adults 34 -58 inches (85 - 152 cm) Averages 3 - 4 feet. Appearance Long broad head distinct from a slender neck and a slender body. Large protuberant eyes. Adults are nearly uniform in color with a brownish ground color and no dark markings. Sometimes the dorsal scales appear to be edged with dark color. The color lightens on the sides, and the underside is light with no pattern. Young are pale with light streaks across back. Primarily nocturnal and crepuscular, but also observed active in daylight. Probably active from late February through October in the northern part of its range. A good climber. A constrictor, May strike viciously when threatened. 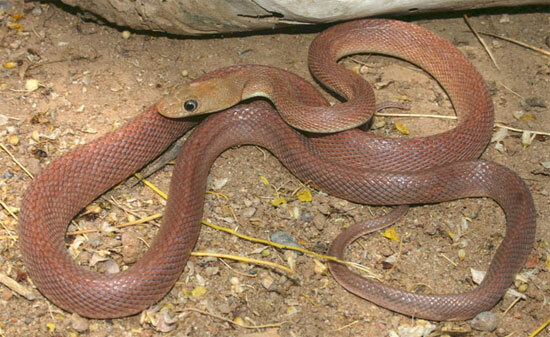 Probably preys mostly on small mammals, but has also been found to consume bats and lizards. Lays eggs which probably hatch from June through October. Listed as present in California from only one specimen that was found dead on Interstate Highway 8, 2-2/5 miles (3.84 km) east of Mountain Spring in Imperial County on May 26th 1984. 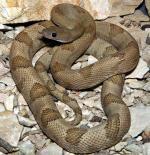 South of California, this species occurs on the eastern slope of Baja California south to the entire cape region. Distribution is spotty and not well known throughout the northern part of its range. The presence of this snake in California has been a popular topic of speculation and rumor among herpers, especially on the internet where unsubstantiated and unverifiable claims run rampant. Some question the validity of this record saying it could have been a dead snake (from a private collection or recently smuggled from Baja California) that was thrown on the freeway (presumably as a prank). Others say the habitat is marginal or too high in elevation for this species, and that since very few specimens have been found in Baja California near the California border, it is unlikely the species ranges as far north as California. Some veteran California herpers say they have searched in vain for this snake in California for many years but found them not too far south of the border. Others believe the record is valid and that more specimens have not been found because few people go into suitable habitat in the area anymore due to the the current border war between illegal immigrants and drug smugglers and the Border Patrol. The rough terrain also discourages hunting. 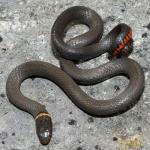 The difficulty of searching for snakes on a busy freeway is also mentioned. Since the species is protected by the state, anyone who finds (and presumably illegally collects) this snake in California will never report their find or deposit a specimen in a museum, so we will never get an accurate report on the abundance of this species in the state. One argument (attributing data to Lee Grismer, the author of the definitive book on the herpetofauna of Baja California), claimed there is scientific proof because the lateral scale count is highest and the scale size is smallest for this species at the southernmost part of its range, and that the scale count decreases and the scale size increases in specimens as you travel north. Since the California specimen has the lowest lateral scale count and largest scale size for this species (even lower and larger than those of northern Baja California) it makes sense that the snake comes from the northernmost part of its range. There is no doubt that there will be many more arguments for and against the occurance of the snake in the state as this lively discussion continues. Associated with dry rocky habitats in Baja California, including canyons, bajadas, thorn scrub, palm groves, springs and streams.